LDL | Mainline Conveyor Systems, Inc. The load lift device is a standard belt driven live roller conveyor (accumulating or nonaccumulating) mounted on a pair of hydraulic scissor lifts. The mounted conveyor includes standard components such as the belt, drive / take-up package, and liftout load carrying rollers. Low profile pressure rollers and pressure roller mounting angles are used with the standard over tiebrace belt path to achieve a 12″ TOR profile without requiring a pit for the lifts. Standard structural features include a 4×2 rectangular tube tiebraces and terminal roller assemblies. 8″ structural channel replaces the standard 5″ sideframes to allow the conveyor to span lengths up to 20′. An edge sensor mounted to the bottom of the side frame channel detects obstructions as the conveyor moves toward the floor. Typically, a transfer device is incorporated in the conveyor to provide side discharge to auxillary operations. This transfer device can be of the standard roller chain design or a flat top chain design with reduced load marking. 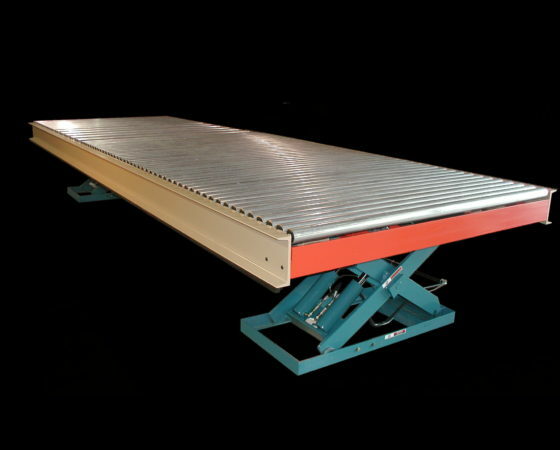 Longer conveyors may include up to three independent zones for load accumulation and lateral transfer.